Watch me making chai from scratch on CTV. Tea. The ultimate comfort drink, anytime day or night. Well beloved of the English and all over the world, including China and India. The variations in the way people drink tea is amazing, each region having their own twists and traditions. The Chinese like it light, the English love their 'builder's tea', the Japanese have an entire ritual around it, and the Indians... well, we love our tea stewed to death with spices and sugary enough that it could be classed as a dessert. Kim at Jhovaan has a really interesting post here on Badawi Shai or Bedouin Tea. 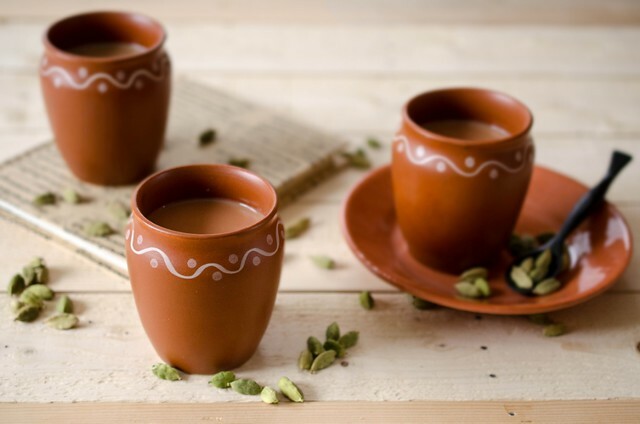 b) Chai is one of the basic necessities of Indian life, so to be snobbish about it is actually laughable. This is the point I totally lost it, and fell over laughing!! Zen in a cup of chai? Aspiring to a higher level? Of what? I would imagine the chaiwallahs in India would have a really good laugh at that too. Anyway, the article did push me write this post on chai. 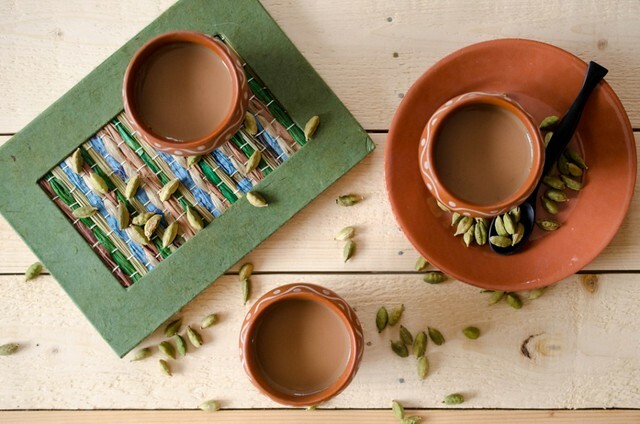 Now, masala chai, like curry powder has no one recipe. So to claim that my recipe is authentic will be arrogant and erroneous. What I will say though, is that this is a recipe that is perfected by me, and has been enjoyed by my family. 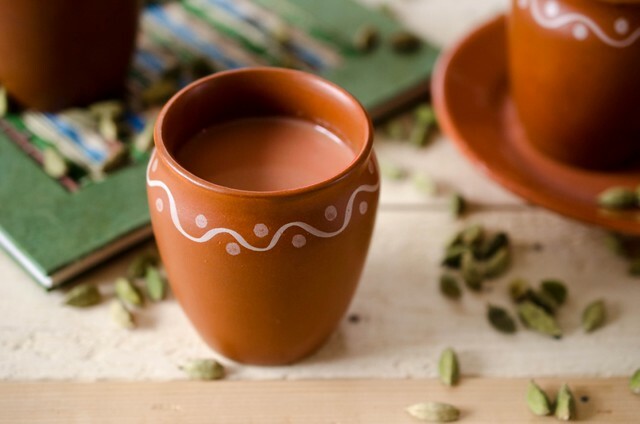 Everyone in India (and the world, including Starbucks) will claim that their chai recipe is the best, and it could very well be the truth (don't know about the Starbucks version though!) But the whole point of chai, is that it will always be as individual as the person preparing it. It could be as easy as throwing some cardamom and ginger into a cup of black tea and swirling in lots of milk and sugar. Or you could, as in the Maclean's article, spend an entire day stirring a pot of chai. Either way, you adapt the recipe to suit your taste and spice cupboard. 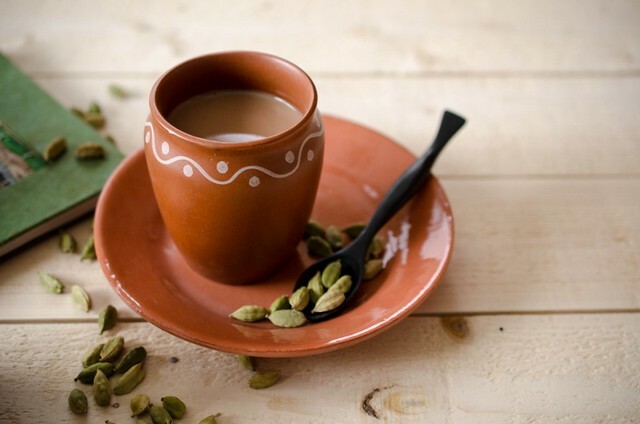 I will, however, make the extravagant claim that nothing beats the taste of freshly brewed chai, with those lovely spicy hints, and warm memories of cold winter's days in Delhi, sitting around in dhabas, debating politics :-) Betcha not even that Montreal teashop can top that! Take the seeds out of the cardamom pods. In a mortar and pestle, crush all the spices coarsely. Don't worry about getting them into a fine powder. Mix the loose tea (or teabag) and the spices in a teapot. Add the ginger and just boiled water and let it steep for at least 3 - 5 minutes. The tea will be quite strong, so if you prefer a lighter tea without milk, then steep for only 2 minutes. Strain the tea into mugs or teacups, add milk and sugar to taste, and serve. I would love to have this cup of tea, so fragrant and aromatic. Interesting post. I'd noticed that chai has become rather popular over here. I first had it (indian spiced variety) in Australia about 15 years ago. Your recipe sounds lovely, although I wonder if you actually meant 4 tbsp rather than tsp? Thanks for picking that up Choclette :-) Yes I did mean tsp, not tbsp. It depends on what tea you're using too. Darker the tea, lesser to use. I came across an abomination here in Edmonton - espresso chai... really!! A chai latte with a shot of espresso... I almost keeled over with shock at that :-) Some things need to be left well alone. This looks amazing! As I read it, I wondered: would it be possible to crush the spices beforehand to make a tinned "chai mix" which could be popped into one of those little "tea eggs" for easily-made individual cups? Yes, absolutely. The fineness of the grind is always a sticking point. I like my mix to be fairly coarse, as I only have seen coarser tea eggs here. But the finer ground the spice, the stronger the flavour, but your tea mesh has to be very fine... I saw a nice fine one in David's Tea the other day, so its possible to find them. 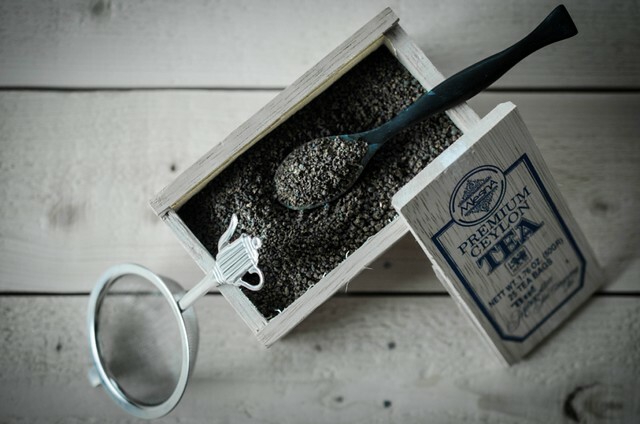 Granulated tea would also work better for tea eggs, and you can find good prices in Indian/ ethnic groceries, and as its quite strong you wouldn't need more than a couple of teaspoons for an authentic chai. Good for you - we need to temper the food elitism and snobbery that have risen and escalated in the past 5 years. It's just food folks - keep it real, accessible & fun. Humour is a good way to do that. Hey, did **I** write this post? Well, no, because I would have also talked about Kenyan chai. But, I could have. I don't know how many times I have thought, "Chai tea! Why in the world would anyone say, 'Tea tea'? It makes no sense." And, knowing me as my wife and kids do, I'm sure I've actually said it out loud many times. I'm the only one in my family who likes masala chai, so, when I'm the one making chai in the mornings, I make my litre separately from my wife's. I cheat and use a spice mix — it has orange peel which adds a really nice flavour. I will try your recipe, though. As for Starbucks — I only get that when it's the only thing available, like in an airport when I travel. Kenyan tea, at least what we can buy in-country, tends to be very finely ground. I like it because it makes a much stronger tea. But, most tea eggs or other strainers don't work because the tea leaves go right through the holes. We've found some very fine-mesh nylon infusers (replacement infuser for Chatsford) from devotea.com or metal (Tee-li brewing basket) from specialtea.com that work really well (I get no commission). Besides the determination to make better chai, what I really took away from India was an appreciation for hospitality. I often worked with very, very poor people, but they were so kind! Every day someone would invite us into their home, giving us fresh fruit or coconut water or chai or a soft drink. The West needs to sit up and pay attention! Thanks for your lovely comment Mirawyn. I am actually in India and enjoying that hospitality, as we speak. I love that I can basically call up someone I haven't seen in almost a decade, and hang out with them, and feel like it was just yesterday. I use cassia, as that's what Indians would use. Keep your lovely Saigon cinnamon for exclusive treats, its expensive and harder to come by. I use a sprinkle of it on my coffee sometimes. Saigon also has a stronger flavour, so it would overwhelm the chai. 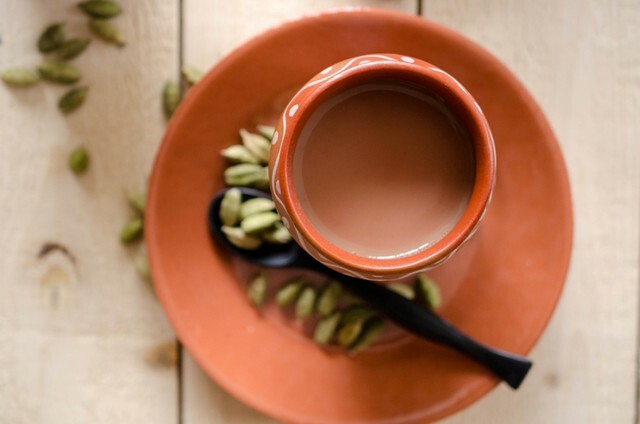 Masala Chai seems a bit different from the usual tea we enjoy, it really seems more like a dessert. Good read. Hello. I love those cups. Did you buy them somewhere or did you just found the pictures on the internet?